Most of the winter weather alerts issues last night remain unchanged this morning with one exception. A Blizzard Warning has now been issued for areas East of Denver and Castle Rock. drifting of the snow is likely. you must travel, have a winter survival kit with you. Western Colorado and Southern Colorado South of the Palmer Divide. Everything is more or less on track, the outer bands of the storm have begun to bring snow and wind to the area as of this morning. If you’re wondering where all the snow is… patience! The main energy of the storm is over Northwestern New Mexico this morning. As it moves Eastward later this morning and into this afternoon expect snow to intensify and winds to increase. 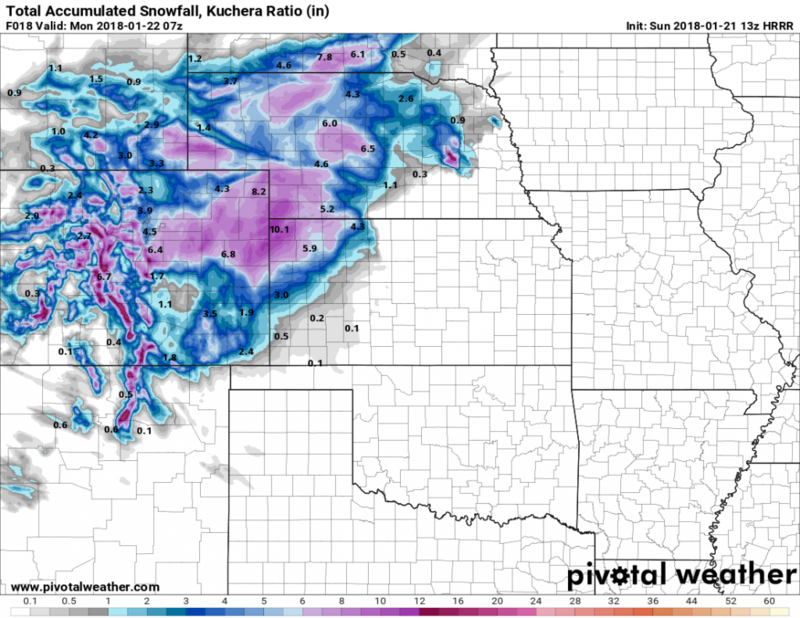 Latest HRRR run for accumulate storm snowfall totals. Still on track! We will pass along any further updates throughout the day as needed, for now it’s best to stay home, relax enjoy time with the family or a movie and let the storm pass. Have a great day and stay warm! Will you be providing actual storm totals? I’ve not been able to locate Monument/Palmer Lake/Palmer Divide totals thus far. I’m working on a map that shows the storm totals for many locations. I’ll be sure to throw in some for that area if I can find them! Hope to have it up sometime on Tuesday!